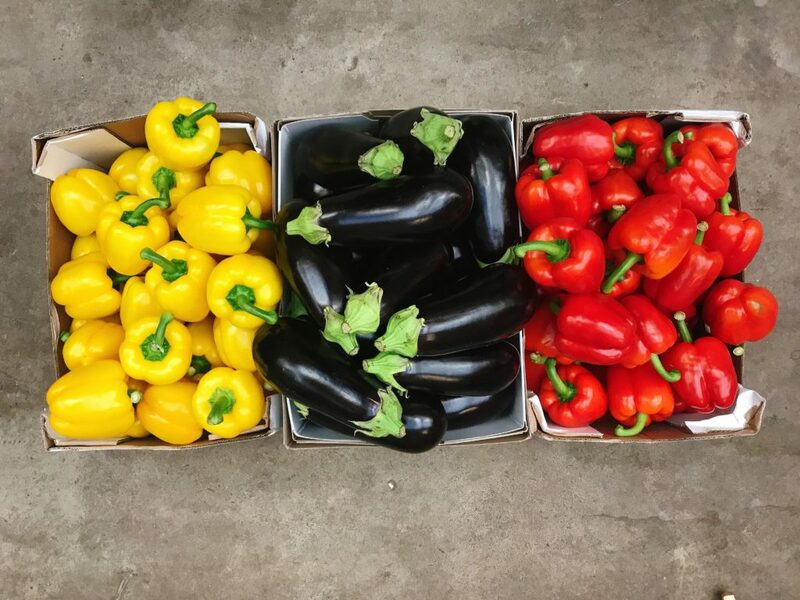 At a time of the year when many veg crops are finishing and becoming scarce in the UK, the new season Dutch glasshouse produce offers some much needed colour and promise of the growing season ahead. The first Dutch bell and Ramiro peppers are trickling through and looking pristine, so too are aubergines. These shiny, voluptuous fruits roast, grill and fry to silky perfection, a great option for an Easter lunch. The first fresh garlic of the year is due with us on Wednesday. Unlike the more common dried form the whole stalk can be used – chop finely to bring a delicate garlic flavour to dishes. From Europe. blueberries, asparagus and broad beans are abundant, which means good value and top flavour. Spanish butternut squash are coming to an end as well as the giant pieces of French Muscade; we’re also on the last of the Nadorcott Moroccan clementines after a fantastic season. Easter weekend can be tricky from a logistics point of view, with 3 bank holidays to negotiate and the shop being closed for Easter Sunday. We’re open as normal on Friday and Saturday and are expecting a full and complete range. While we enjoy the long weekend many of our farmers will be working straight through – we’ll have local Glebelands salad and a fresh drop from Lyncroft Farm’s Duncan Gielty on Tuesday morning. You can expect a few gaps on Tuesday and Wednesday as we get back up to speed, but we’ll do our best to ensure as little disruption as possible.